Made in-house at Patinkas, this is a delightful Traditional Tree Resin Incense Crystal Cleansing set. 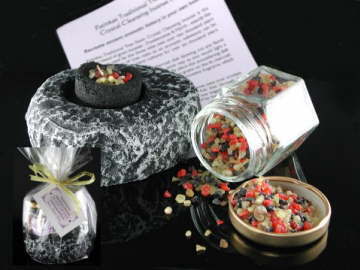 Comprising resin burning stone (approx W90mm x D70mm), pack of 5 charcoal burning disks, 25g jar of Frankincense and Myrrh grain incense plus instructions for use including how to cleanse your crystals using this traditional and ancient method. Comes gift-wrapped and finished with a raffia tie and Patinkas tag (see inset picture, bottom left).